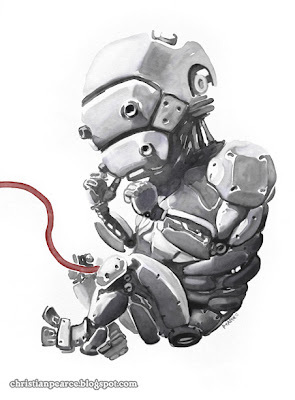 Christian Pearce: Art for Ted Chiang's "The Lifecycle of Software Objects" - part one! Art for Ted Chiang's "The Lifecycle of Software Objects" - part one! Here's a project I recently completed that was pretty interesting for me, the illustrations for Ted Chiang's new novella "The Lifecycle of Software Objects". I had read a couple of Ted's stories before he had contacted me so I was pretty stoked to be involved and jumped at the chance, I think his stuff is terrific. You can listen to his Hugo Award nominated story Exhalation here! This illustration was the first one I completed and became the cover image. We went through quite a lot of different illustrative styles before getting to this one and I'll show some of those and a few of the other paintings in more blog posts. That's awesome Christian. I've been seeing that pic pop up all over recently talking about Chiang's new book. I really liked the art you created for "The Lifecycle of Software Objects." I especially liked the one you created with the building blocks. I'm an AI PhD candidate working on an approach similar to the one in the book. I've got the picture with the building blocks up on my wall to help inspire me as I work. Thats great man! I love the style. Is that Artrage? that exhalation short story is fantastic! looks like i'll be chasing down more work from this ted guy... cheers! Hey thanks everyone! Hi Nick! Binh - that's really awesome to hear! Thanks so much for stopping by! Yeah Kevin, Artrage! ARTRAAAAGE! It's pretty clunky and frustrating to use sometimes and I can see why they put the 'rage' bit in there but boy it can really do some neat stuff. Both you AB's - gracias! Muy gracias!